Could Mad Max have used Cubesats in Fury Road? | Michael Hirsch, Ph.D.
Could Mad Max have used Cubesats in Fury Road? Given the great resourcefulness of characters throughout the four Mad Max films in a post-apocalyptic environment, it seems odd that still working satellites, especially amateur satellites weren’t exploited. One may argue that the satellites could have all fallen victim to EMP from a possible nuclear war. The star fields shown appear to be synthetic, a disappointment as it would have been a great Easter Egg to show the location in say Western Australia. The production crew spent so much effort on authenticity of set props that it wouldn’t have been so much relative cost to make an accurate (albeit apparently sped up) satellite pass. A licensed amateur radio operator needs little more than a simple $27 Baofeng VHF/UHF (144MHz/430MHz) FM transceiver to communicate through amateur satellites. One can buy an $90 Arrow antenna and that’s a complete satellite communication system, allowing free communications over most of a continent. For certain higher-orbiting LEO satellites, you can get limited intercontinental communications. It’s 45 years since the apocalypse–you can simply build your own Arrow-style antenna using coat hangers, and build a duplexer with gimmick capacitors and self-made inductors. Worst case, skip the duplexer, use two walkie-talkies and two antennas. Who could Mad Max talk to on the satellite? 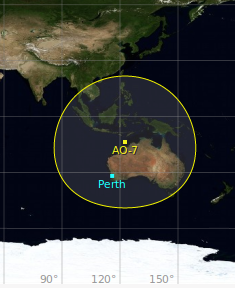 According to Gpredict, and assuming the highly circular ~1450km altitude of AO-7 hadn’t decayed much, and that the very simple electronics of AO-7 survived the EMP (if there was a nuclear war in the Mad Max universe), then AO-7 in it’s VHF/UHF mode would be a good candidate to talk to Indonesia, Papua New Guinea, and of course the whole of Australia from the supposed Western Australia location of the characters. Shouldn’t be an issue, with a rubber duck antenna and 4 Watt satellite, it’s possible now, how much more so when there are very few anthropogenic signals about.